The news that Captaintreacherous is retiring to stand at stud will create a lot of interest among breeders and studs in Australasia. I imagine there is already a lot of action behind the scenes to negotiate rights to him “downunder”. You would imagine Empire Stallions might have the inside draw for that race, as they stand his sire Somebeachsomewhere, and of course both father and son are standing at Hanover Farms in America. For me, the most appealing thing about Captaintreacherous (in terms of his pedigree) is that he is a son of Worldly Treasure, rather than that he is a son of Somebeachsomewhere. See my previous blog about his maternal family which is an exciting branch of the great Romola Hal clan. Another son of Somebeachsomewhere with an outstanding maternal line is the new kid on the block at Macca Lodge in New Zealand, Net Ten EOM (which translated means “payment ten days after end of month”). He shares his maternal line with the excellent sire Well Said, and it has class all over it. Many top performing fillies like his dam Glowing Report and her dam Grand Lady struggle to duplicate their success in the breeding barn, but this maternal line is one where performance in both departments is deep. He is available for just $3000, and although he only raced 17 times, almost entirely as a 3yo, he took a record of 1.49.4 and raced under 1.50 three times, before retiring with an injury. Definitely worth a look. Of course Macca Lodge also stands Panspacificflight, who like Captaintreacherous is from a branch of Romola Hal, in fact from a full sister to Art Major’s dam. A holiday from horses – not quite! We are back from a three week holiday in Spain, a treat we’ve been planning for a few years, hence not putting our mares in foal in the 2012 season and therefore not having any yearlings around us now. So apologies for the lack of blogs lately apart from a few generic ones I scheduled before leaving. There is almost no trotting in Spain at all apart from hobby type local races on the island of Mallorca (Majorca) off the coast of Spain, which is a beautiful and popular tourist destination but not where we wanted to go. However horses did become a part of our trip, inevitably, as horses are so much part of the history and lives of human beings all over the world. As the photo above shows, in downtown Sevilla, Spain, the old fashioned method of “horsepower” is a tourist option, but integrates easily into the relaxed and winding pattern of the busy Sevilla streets. 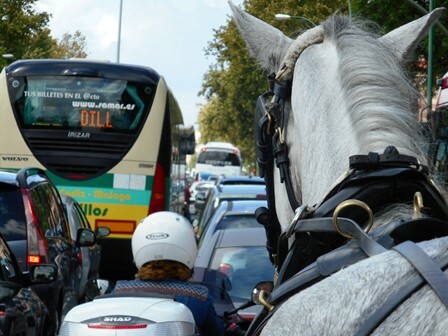 The horse-drawn carriages mix with motorbikes, cycles, cars and buses, with everyone showing respect and no horns hooting or road rage. Also, the horses appeared very well cared for, although the wear and tear of the hard streets must take its toll. We also had the good fortune to see the famous Royal Andalusian School of Equestrian Art’s show of “dancing stallions” in Jerez, close to Sevilla in the south of Spain. No photos were allowed, but take my word for it, the strength and control of the horses and the communication between human and horse is fantastic. Check out this short video clip on YouTube. The photo below is of a large painting on the wall of the arena. On the home front, the first of this season’s foals was born while we were away – a lovely filly from Kym’s 3-win trotting mare Toggle. Toggle is a half-sister to Sun Isa and at 9 years old this is her first foal, by Majestic Son. Many of you will already know Harness Racing Update – the online newsletter that covers news and views of US standardbred racing at the main tracks. If not, it is well worth a read. Although the emphasis is on racing, there is plenty of interest for breeders such as the breeding of the winners and place getters in current racing, and some good interviews with owners and trainers about specific horses, as well as insights into the controversies and issues in the northern hemisphere. The link is here and subscribing is free. Some months ago I saw this book advertised in Harness Update newsletter, and ordered a copy from America. That’s not a cheap exercise when you have to pay virtually the same again to ship it out, but wow! it was worth it. It is a beautifully produced hardback book of over 200 pages, with sensational photos by Barbara D. Livingston and stories by Ellen Harvey. The subjects of each chapter are a standardbred racing horse who is now living in happy retirement – their story and photos of their current life. Time passes….and some have already died, the most well known being Matts Scooter who is given a wonderful write up in this book, and Cam’s Card Shark likewise. 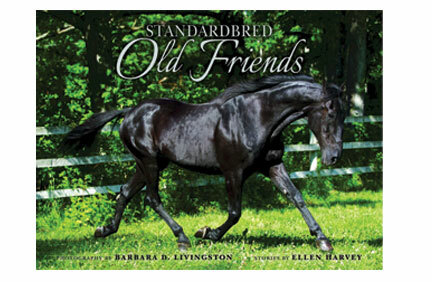 Other well known standardbreds in retirement are also in the book – CR Kay Suzie, Jate Lobell, Lady Ashlee Ann, Lilting Laughter, Mack Lobell, Moni Maker, Three Mile Island amongst them. But there are many others less well known but good performers with a great story to tell. I haven’t read all of them yet – I’m a slow reader and to be honest I want this book to last a long time. I am not sure if copies are still available, but if you love reading about and seeing photos of great race horses and broodmares being well looked after in older age, then it’s worth considering buying a copy or sharing one between friends. You order it online – Harness Racing Museum & Hall of Fame Gift Catalogue = and all the proceeds of the sale go to help defray their day-to-day expenses. Try to click here to get straight to the book or here to reach the overall website for the Harness Racing Museum USA. One of the classic races and dear to my heart as I saw it first hand and really enjoyed the experience. The two horses that seem to stand out are McWicked (the McArdle colt trained by two-times Jug winning trainer Casie Coleman) and He’s Watching (the American Ideal colt trained by David Menary). It’s a tight track and draw can help or hinder a horse’s chances, but to be fair, usually really good horses win the Jug. 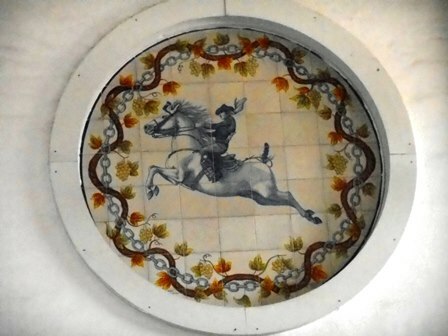 In the end, the Jug comes down to which horse can perform at his best for the two heats on the same day – and often the winner will run really quick times in both. It’s a race the horse needs to be specifically aimed at and trained for. Phil Bourke commented on my blog about Three Diamonds and a ton of Adios (written back in April 2012, but I linked to it recently) that He’s Watching has a double up of the great mare Three Diamonds, being by American Ideal from a Real Desire mare. It’s also worth noting that He’s Watching was a $3,000 buy at the 2012 Standardbred Horse Sale, mainly because he was a later smaller horse. What a cracker he has turned out to be! McWicked is the horse McArdle has been looking for these last few years, a standout. If he’s the winner, it could give the Bret Hanover/Falcon Seelster line one more chance at continuing as a siring line in America. For my money the beautifully bred Well Said colt Tellitlikeitis could be the sneaky. This blog was written prior to final fields so forgive me if there is a late scratching.